Summer this year was nothing short of amazing here on the future homestead. I say future homestead, because, as you know, we purchased this 2.5 acre ranch last February and we plan to show you how to start small and make a homestead out of anything. Homestead is in the heart, I always say! And life what you make it. You grow where you are planted. We happened to be planted in a little brick ranch that has a pretty amazing view. I have so much to share with you. I know it has been a long time since I last wrote on the blog. That is very unusual for me because I take all of my commitments very seriously. My web helper went away for the summer so I had been unable to do a lot as far as the technology of running my blog. Since I last wrote much has been going on. I will bring you up to speed! Those of you that come to my Talk show on Tuesdays (Every Tuesday at 2 pm CST aired LIVE) have been able to enjoy a lot of my stories coupled with so much wisdom from Nancy who partners with me. 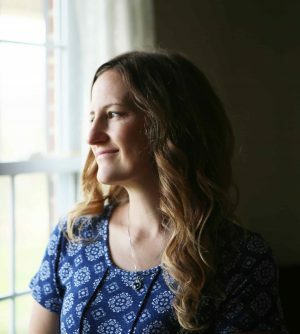 She always prepares a bible study on womanhood and chime in with some fun practical stories. Anyone is welcome to visit my page there and watch all the videos we have posted. They are recorded LIVE and archived so you can watch these anytime. We traveled up to Wisconsin to visit family and had lots of adventure. Both Mark and I were born and raised in Wisconsin. 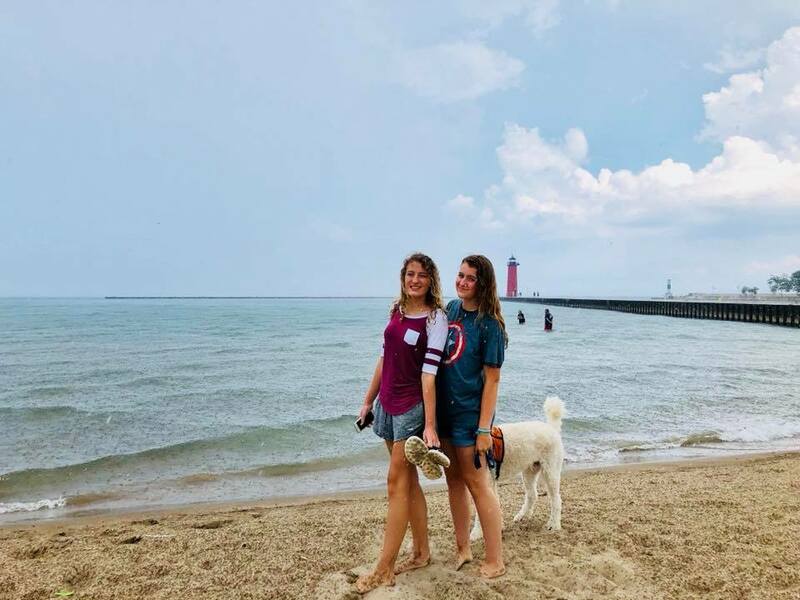 We had the most amazing time with Marks family in Kenosha, Wisconsin at the beach there! So funny. First off, Nana and Grandpa Les were so amazing to find such a great place to visit which was so fun. We get there and the sun was shining and the cool breeze off Lake Michigan was incredible. You would not believe it, there was this one black cloud that was over head. Just one little one. You would think it would just pass us by, but no. No sooner did we get Grandpa Les and Nana sitting on a rock, did that cloud decide to dump a load of torrential rain on us!!! Mark had to make sure they did not slip on the rocks, we were all soaking, I mean sopping wet with rain, and walking straight back to the vehicle. We, at this point, did not get to even enjoy the Lake. They are such troopers. They said we could enjoy the beauty of the Lake by driving past and guess what?! Soon as we get back into the vehicle, yup, you guessed it, the sun came back out. So funny! Well it was so special. 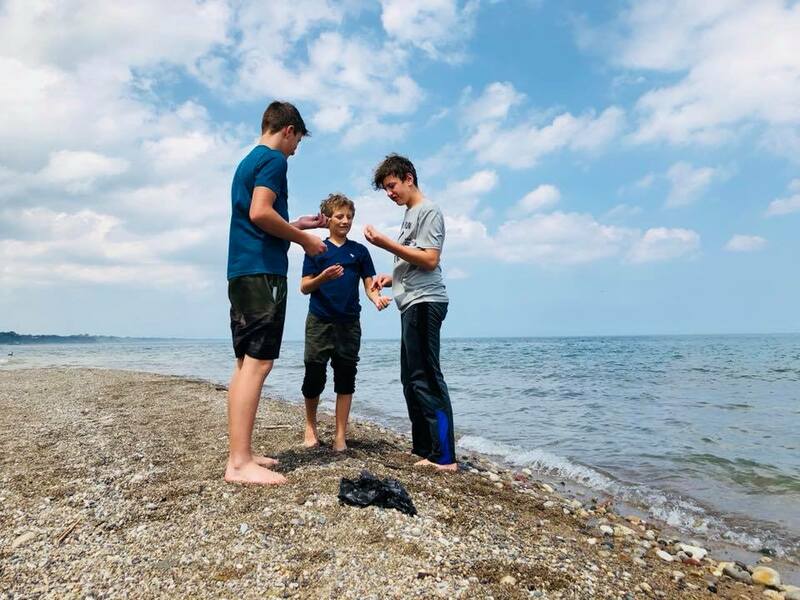 We got out again and this time the children and I were able to get to the water, look for pretty stones that had been smoothed by the waves. Listening to the waves lap into the rocks was so relaxing. It was just so incredible to spend time with our precious loved ones that day. 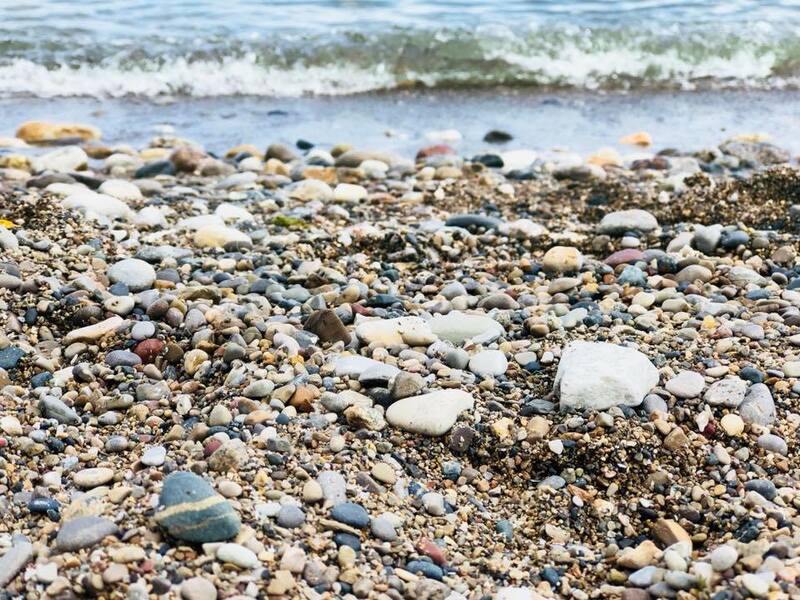 I saved a handful of the smoothest rocks to remember our day together. I will hold it in my heart forever. From there, we traveled another 4 hours to my parents cabin. Mark built this cabin about 15 years ago now when he was working construction with a group of Amish men. We stayed the summer that year in a little camper all packed in with Amish men, 3 babies, and one Amish young woman that was there to help cook and clean. It was such a fun memory. On the way to the cabin, I got word that my Amish “mother” had passed away. Her name was Rosa Bontrager. She was one of the biggest influences in my life. She was a true Titus 2 woman. I showed up on her doorstep some 16 years ago trying to be Amish in a world where that was against the tide. Rosa took me under her wing and taught me how to butcher animals, how to bake, how to garden, how to can food, and how to be Amish. 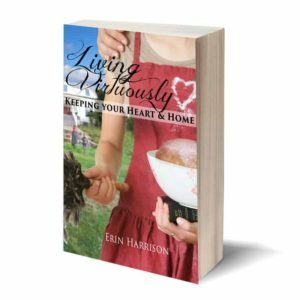 Homesteading is a way of life for the Amish and it is where I really got my first real taste of the back to basics. It was not an easy path that I had chosen at the time, but she made me feel like family which made learning so much easier. Many hands make light work. Being a part of her life was so healing to me at the time. It was such a divine moment that we were actually in the area at the time that she passed away. I was meant to go there and be there for her funeral. I found a black dress and we drove to her home where they gathered their 14 grown children and their children’s children. They invited me to come on the family day because they viewed me as family. I approached her casket and broke down. The life of a woman faded. Like a rose that was once full of vigor and glory, just lying there without a motion. All of her daughters lined up to the back of the wooden box and I hugged each one. She was my mentor. She was my close friend and very much like a mother to me. When I was a young mother, and and English one at that, she did not think twice. 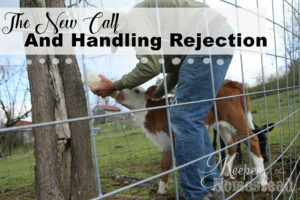 While other Amish women looked down their noses waiting for me to fail, she saw a willing heart. She saw a teachable soul and poured into my heart years of learning. Our hearts were intertwined from that day forward. 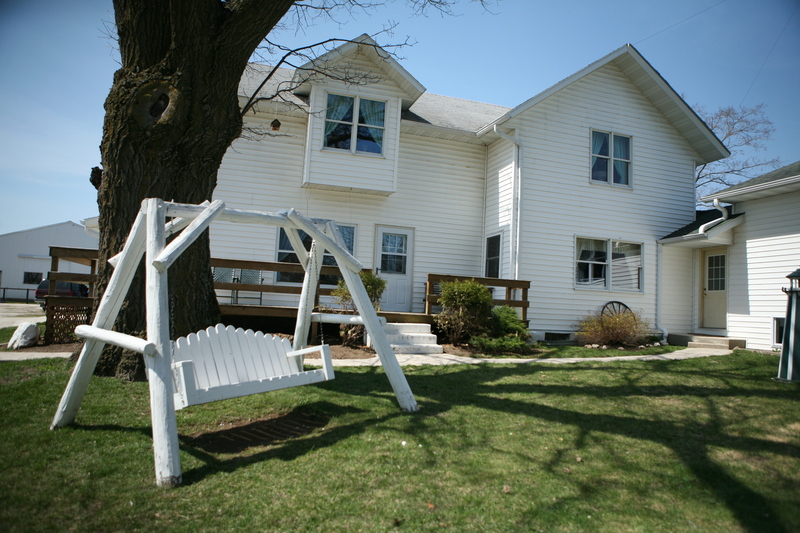 Here is a photo of their Amish homestead. Its not typical for an Amish man to hug a woman, much less hold a woman in his arms that long, but it was emotional for us at that moment. It was a father and a daughter. It was giving an accolade that is eternal in so many ways. He told me that when she was dying and when she was unable to lie in his bed at night, he would pull up the recliner beside her hospital bed in their living room just to be near her. He would hold her hand even when she did not know who he was and when her silence was deafening. Her warm body and beating heart was enough to console him when there were no words. He told me it was very rough watching her over the past several years go down hill year after year as the Alzheimer took her mind. One story that was completely miraculous was when he took her on a train to Mexico to get treatment for her Alzheimers. He loved her so much. He would go to the ends of the earth if it could have cured her. At one train station in San Diego, he told her to stay right where she was and watch their luggage while he used the restroom and when he returned she was gone! He looked everywhere and nothing. He sat there for hours praying and hoping that she was okay. In her condition, she would never know where she was and she would forever be lost and not even remember where she lived to get home. Amish do not use cell phones so she would not be able to call for help. Amish never take photos of themselves so she would not have any photo ID. It was a very dangerous situation. She was in no position to be riding around on trains by herself. Many hours later Rosa, came off a train that was headed South. A man, who they believed to be an Angel delivered her right into her husband’s arms. Mysteriously, he knew where she came from and the exact bench he would find her husband. She was confused and had boarded a train that led her several hours up the coast of California. God knew where she was and where she needed to return to. Only God knows every hair on our heads, who we are, and where we need to go. 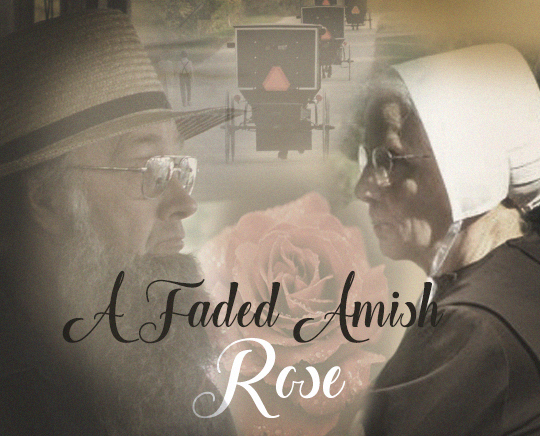 The neat thing is that Rosa’s mind was failing, yet she trusted a non Amish man whom she never met and he somehow got her on the right train. Wow. God is a God of the impossible. After visiting and catching up on life with all my Amish community, they invited us for lunch. They had tables lined with all kinds of hearty casseroles and desserts, bread and jam, pickles, and salads. It was served in the same basement I spent so many hours with Rosa, canning and cutting up either vegetables from a late harvest, or meat from the fattened hog, chickens, or cattle. They always had something to cut up in that lovely basement of theirs. I remember one time when we were skinning chickens out in the barn. It was my first time. Rosa had her handkerchief pulled tight around her little head because of the lice. The Chicken lice. I soon found out what that was like. My head was crawling with the lice and she gently encouraged me, “Oh, it’s no big thing. They can’t survive on humans very long.” I hated it but I pushed through because I did not want to look like a wimp. If I was to get any respect among the Amish, I needed to start with smiling while I butcher stinky chickens with a head crawling with chicken lice. It was one of those moments where you are smiling on the outside but cringing on the inside. I never ran so fast to a shower in my life. The shower that I was facing as I put food on my plate. There were so many memories in that home that I could write a book. I have thought about it. Not everyone gets to live among the Amish and have the experiences that I have to share. After saying goodbye to their home and all their lovely faces, I longed once again for yesteryear. It is really a lost lifestyle they have and I have such a vision for the future of our blog. As I look back to all the years learning and growing in all the places we moved to, I realize that my job is only beginning. My children are nearing adulthood and they will soon be passing their skills onto another generation as well. 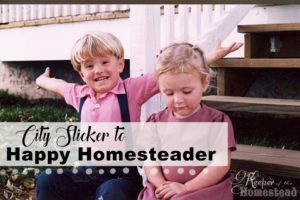 While the blog was quiet, our minds were busy planning the future of our homestead life. 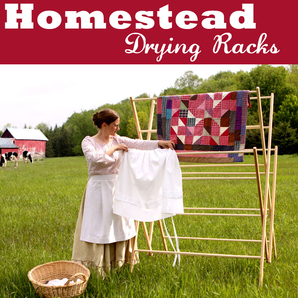 We plan to have all you need eventually on the homestead. 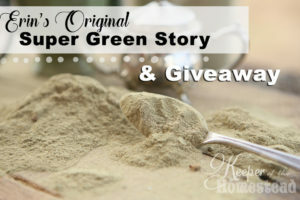 I am starting with my favorite herb collection, my super greens, and my teas that I have used through the years. Time tested old fashioned recipes. It will then branch into more resources, like an Amish Bulk food store, more cook books, more books containing stories. Camps and places for people to gather together and learn with us. There is so much ahead. We made it up to the cabin that I have earlier mentioned, built by my husband and his Amish crew. 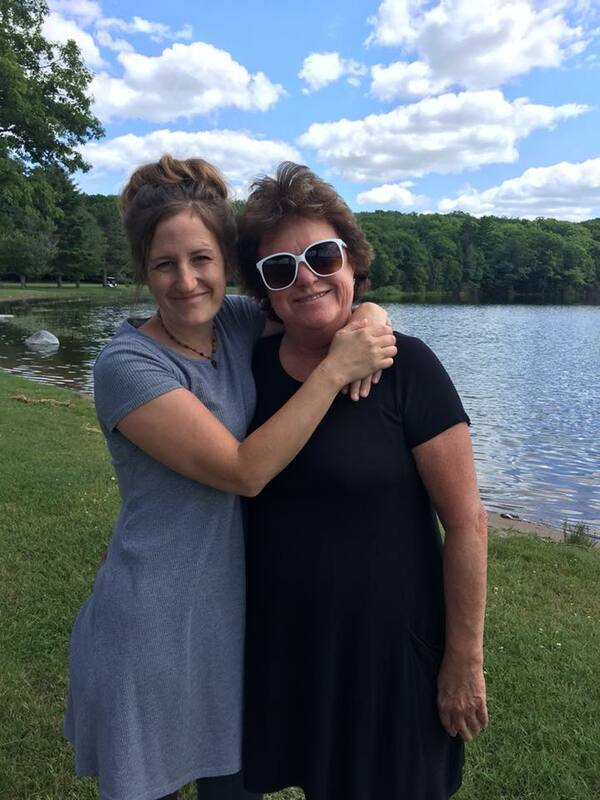 It also holds many warm memories as we brought our children each fall, winter, spring and summer to swim in Hilbert Lake, make campfires, hike to lost waterfalls, and spend time with my parents. 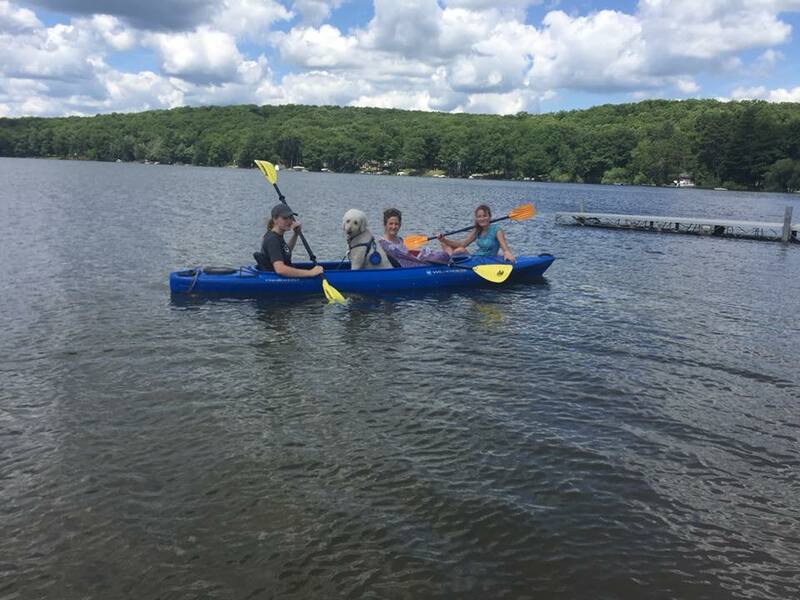 This time we brought Teddy, my daughters diabetic alert dog, on the kayak with her. He literally goes everywhere with her to help her along her journey, keeping her safe. We are so thankful to all those who contributed to this miracle. We were not sure how Teddy would do on the water, but he loved it. He seemed so relaxed and when he was thirsty, he would just dip his mouth over the side and into the water for a drink. How handy. We had hours of relaxing trips on the water together, hearing the sounds of the gentle breeze, the push of a paddle swishing the water around the kayak, and the loons making their lonesome call before they lost themselves under the surface of the water. What a glorious display of God’s creation. 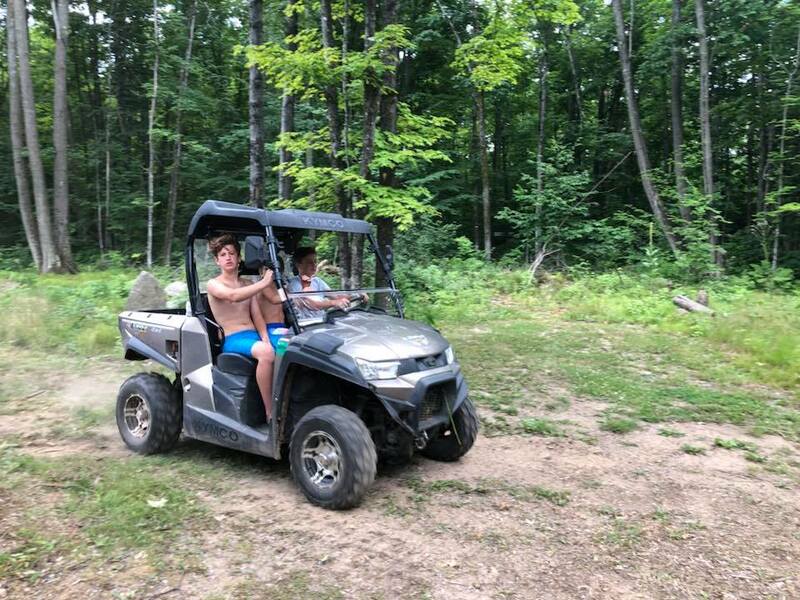 We all spent many hours on trails this year riding around on my dad’s UTV. You can drive for miles and miles and still not even scratch the surface of all the things to see in the woods surrounding their cabin. 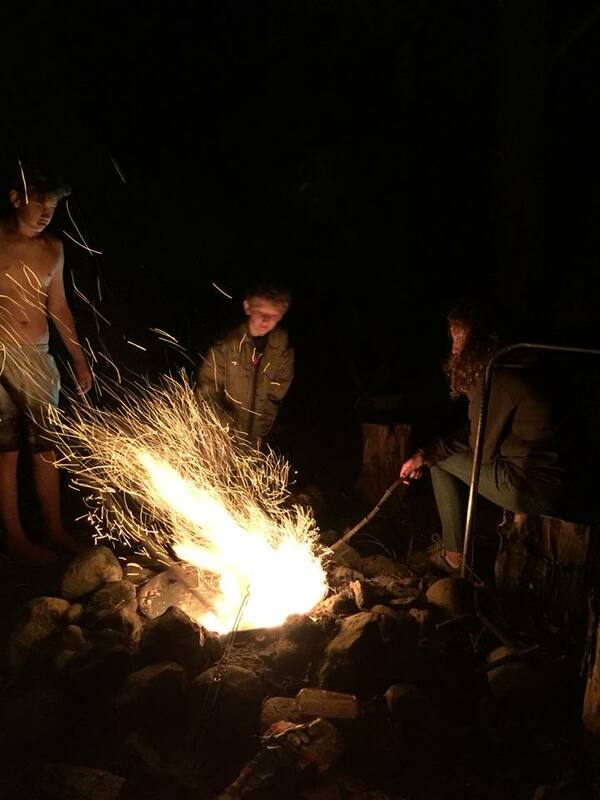 Nights were filled with campfires with sparks traveling into the black, star lit skies. There is something so special about gathering around a fire to tell stories, roast marshmallows, or listen to the crackle of the logs burning. My dad is the music man. He was a High School band director for many years and took his bands all across the world. He has inspired so many with his way of composing and encouraging. He arranged a song for my girls to sing. 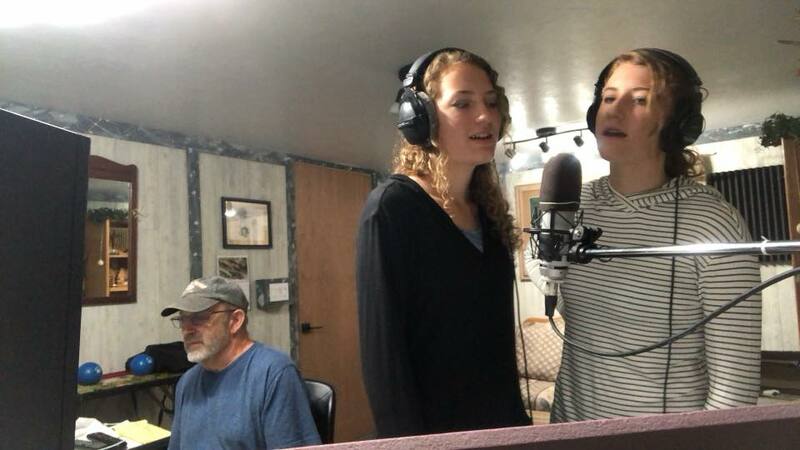 They were able to record the song together and it went really well. My girls actually write their own songs with guitar or ukulele. It is truly a gift to hear them make music together. We all enjoyed the simplicity of nature and family for a week in Wisconsin. This was part one of three, since there is so much to share. Stay tuned for the next two parts of our Summer story. The stories will include all the steps of our remodeling projects, homeschooling fun (lots of tips to help you make school come ALIVE), exciting NEWs of what’s in store for our Homestead, and more crazy adventures. God bless your week! Hi Erin I love your story of growing up..we will be heading to NC in November we live in Australia and looking forward to visiting family and new. I would love to meet you, too, Anita! If you come to visit us from NC it would only be another 6 hours or so to get to us. How fun! Glad you enjoy the stories I share. You are a blessing!